Western Blot analysis of AKT1 expression in PC-12 using Mouse anti Human AKT1 (MCA4779Z). 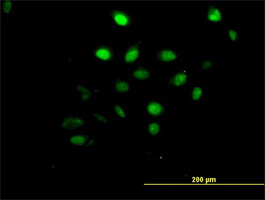 Immunofluorescence showing AKT1in HeLa cells using Mouse anti Human AKT1 (MCA4779Z). Sandwich ELISA analysis of human AKT1 expression using Human anti Human AKT1 (HCA003) as a capture reagent and biotinylated Mouse anti Human AKT1 (MCA4779Z) as a detection reagent with recombinant human AKT1 as antigen to generate the standard curve. Detection is by HRP conjugated streptavidin and substrate. Microtitre plate is read at O.D. 450 nm on the Bio-Rad iMark Microplate Absorbance Reader (Bio-Rad Catalog 168-1135). Serum samples, undiluted (green and blue) and plasma samples, undiluted (orange and red) are indicated. Sandwich ELISA analysis of human AKT1 expression using Human anti Human AKT1 (HCA017) as a capture reagent and biotinylated Mouse anti Human AKT1 (MCA4779Z) as a detection reagent with recombinant human AKT1 as antigen to generate the standard curve. Detection is by HRP conjugated streptavidin and substrate. Microtitre plate is read at O.D. 450 nm on the Bio-Rad iMark Microplate Absorbance Reader (Bio-Rad Catalog 168-1135). Serum samples, undiluted (green and blue) and plasma samples, undiluted (orange and red) are indicated. Mouse anti Human AKT1 antibody, clone 6F11 recognizes human RAC-alpha serine/threonine-protein kinase, also known as AKT1, Protein kinase B, PKB, Protein kinase B alpha, PKB alpha, Proto-oncogene c-Akt or RAC-PK-alpha. AKT1 is a 480 amino acid ~54 kDa serine/threonine-protein kinase involved in many metabolic, proliferative, growth and angiogenic processes. Recombinant protein corresponding to aa 1-481 of human AKT1.